Soto ayam, Indonesian counterpart of chicken soup. Sayur asem, vegetable tamarind soup. Sop buntut, Indonesian oxtail soup. This is a list of Indonesian soups. Indonesian cuisine is diverse, in part because Indonesia is composed of approximately 6,000 populated islands of the total 18,000 in the world's largest archipelago, with more than 300 ethnic groups calling Indonesia their home. Many regional cuisines exist, often based upon indigenous culture and foreign influences. Indonesian soups are known to be flavoursome with generous amount of bumbu spice mixture. Indonesian cuisine has a diverse variety of soups. Some Indonesian soups may be served as meals, while others are lighter. The Makassarese of South Sulawesi, Indonesia are known for preparing "hearty beef soups" that also use coconut and lemongrass as ingredients. Generally Indonesian soups and stews are grouped into three major groups with numbers of variants in between. Soto refer to variety of Indonesian traditionally spiced meat soups, either in clear broth or in rich coconut milk-base soup, example includes soto ayam. Sayur refer to traditional vegetables stews, such as sayur asem and sayur lodeh. Sop or sup usually refer to soups derived from western influences, such as sop buntut. This list includes soups that originated in Indonesia as well as those that are common in the country. Bakso – a meatball noodle soup. Meats used may include beef, pork, chicken, and mixtures of these meats. Additional ingredients often include bok choy, tofu, hard-boiled egg, fried shallots and wontons. It has been described as a national street food of Indonesia. Brenebon – red kidney bean soup, served in broth made from boiled pig's trotters, beef or chicken. Empal gentong – spicy beef offal soup specialty of Cirebon, West Java. Kaledo – a traditional spicy cow's trotters soup from Donggala regency, Central Sulawesi. Konro  – spicy ribs soup specialty of Makassar, South Sulawesi. Opor ayam – prepared with the main ingredients of chicken cooked in coconut milk. It is especially common in Central Java. Many additional ingredients are used. Sop buntut – Sop buntut is an Indonesian oxtail soup. Sop ayam – Sop ayam is an Indonesian chicken soup with vegetables. 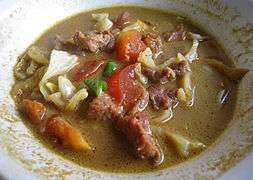 Sop Iga – Sop Iga is an indonesian cow rib soup with celery, tomato, and carrot. Sayur bayam or sayur bening – spinach and corn in clear soup flavoured with temu kunci. Sayur lodeh – vegetables in coconut milk soup. 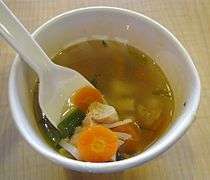 Sayur sop – vegetables soup (common beans, carrot, cabbages, potato, celery, cauliflower, fried shallots), in chicken broth soup, often includes diced chicken. Sop kambing – prepared with goat meat, tomato, celery, spring onion, ginger, candlenut and lime leaf, its broth is yellow in color. Sop saudara – a spicy beef soup contains bits of beef and offals (usually fried cow's lungs), rice vermicelli, perkedel (fried potato patty) and hard boiled egg. The spices includes garlic, shallot, candlenut, coriander, caraway, ginger, galangal, lime leaf, lemongrass, nutmeg and cinnamon. Garnishing include chopped scallion and bawang goreng (crispy fried shallot). Sop senerek – a traditional soup from Magelang with beef, red bean, carrot, tomato, celery, and some bawang goreng. Soto – a traditional meat soup. Many variations exist. Soto daging – beef soup, usually eat with jeroan or quail eggs satay. Tekwan – fishcake, jicama and mushroom soup, specialty of Palembang. Tengkleng – goat jeroan with spicy coconut milk, specialty from Solo. Timlo solo – a beef and vegetable soup. Some versions also have noodles, as a beef noodle soup. Tongseng – a sweet and spicy goat meat soup, specialty of Solo, Central Java. Sayur lodeh, vegetables stew in coconut milk. Sayur bening bayam, spinach and corn in clear soup. 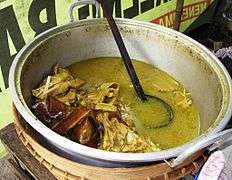 Lontong opor is a common breakfast in Cilacap. 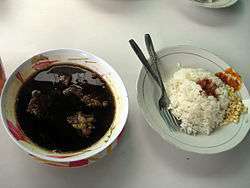 Rawon black soup (left), from Surabaya. Sop saudara beef soup from Makassar. Sop kambing, goat meat soup. Tengkleng, a mutton soup of Solo. Tongseng, sweet and spicy goat meat soup. Commercially prepared and packaged soups are also consumed in Indonesia, including those that are frozen, canned and dehydrated. In 2013, commercially prepared soups had a value growth of 14% in Indonesia. In 2013 the company Supra Sumber Cipta held its leadership in this food category, with a 32% value share in Indonesia. 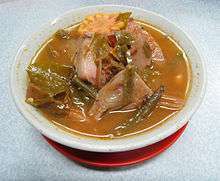 Wikimedia Commons has media related to Soups of Indonesia. 1 2 "Indonesian Cuisine." Epicurina.com. Accessed July 2011. ↑ Nadya Natahadibrata (10 February 2014). "Celebratory rice cone dish to represent the archipelago". The Jakarta Post. Retrieved 2014-07-09. 1 2 Cornell, K.; Anwar, M. (2004). Cooking the Indonesian Way: Culturally Authentic Foods Including Low-fat and Vegetarian Recipes. Easy Menu Ethnic Cookbooks 2nd Edition. Ebsco Publishing. p. 31. ISBN 978-0-8225-2157-0. Retrieved January 30, 2015. ↑ Yuen, D. (2013). Indonesian Cooking: Satays, Sambals and More. Tuttle Publishing. p. 116. ISBN 978-1-4629-0853-0. Retrieved January 30, 2015. 1 2 Von Holzen, H.; Hutton, W.; Arsana, L. (1999). The Food of Indonesia: Authentic Recipes from the Spice Islands. Periplus World Food Series. Periplus Editions. p. 58. ISBN 978-962-593-389-4. Retrieved January 29, 2015. 1 2 von Holzen, H.; Arsana, L.; Hutton, W. (2015). The Food of Indonesia: Delicious Recipes from Bali, Java and the Spice Islands. Tuttle Publishing. p. 168. ISBN 978-1-4629-1491-3. Retrieved January 29, 2015. 1 2 3 4 5 6 7 "40 of Indonesia's best dishes". CNN Travel. August 9, 2011. Retrieved January 30, 2015. 1 2 Associated Press (November 18, 2010). "Bakso: The Indonesian meatball soup President Obama loved as a child". NY Daily News. Retrieved 30 January 2015. ↑ "Recipe: Soup Brenebon". FAO. ↑ Wongso, W.; Tobing, H. (2013). Homestyle Indonesian Cooking (in Spanish). Tuttle Publishing. ISBN 978-1-4629-1106-6. Retrieved January 30, 2015. ↑ Usman (23 March 2012). "Wisata Kuliner Makassar: Menikmati Sop Saudara Dan Ikan Bandeng Bakar Khas Pangkep". MakassaRTV. Retrieved 25 July 2013. ↑ Moskin, Julia (January 7, 2009). "Soto Ayam (Indonesian Chicken Soup With Noodles and Aromatics) Recipe". New York Times Cooking. Retrieved January 30, 2015. ↑ Planet, L.; Berkmoes, R.V. ; Brash, C.; Cohen, M.; Elliott, M.; Mitra, G.; Noble, J.; Skolnick, A.; Stewart, I.; Waters, S. (2010). Lonely Planet Indonesia. Travel Guide. Lonely Planet Publications. ISBN 978-1-74220-348-5. Retrieved January 30, 2015. 1 2 3 "Soup in Indonesia". Euromonitor International. March 2014. Retrieved 30 January 2015.